Harvard is digging through trash to examine what gets thrown out. I can tell you first hand, it’s pretty nasty. On Friday November 19th, I volunteered to go to the Harvard waste sorting facility in Boston with a group of MIT students gearing up to implement a waste and recycling program in Nicaragua with CoLab’s Libby McDonald. I work with Libby on a waste management project in Brazil, so I was interested in tagging along. When we arrived, I realized I had no idea what I had signed up for. Libby drove us to the warehouse, which is located in Allston. We arrived before everyone else, and trying to find the entrance of the building I realized I was unprepared for how cold it was. When Rob Gogan, the supervisor of Harvard’s Facilities Maintenance Operations, finally arrived, we entered the thankfully warm warehouse which was packed with bags of garbage. We made our way past bags of items that were salvaged for Habitat for Humanity and others that were to be sold. Soon after we were joined by students from Harvard Law School, and Rob began to describe the project. Random samples of garbage had been taken that day from the Harvard Law School’s seven residential halls for us to sort in order to evaluate how much compost, recyclables and reusables had been thrown out. 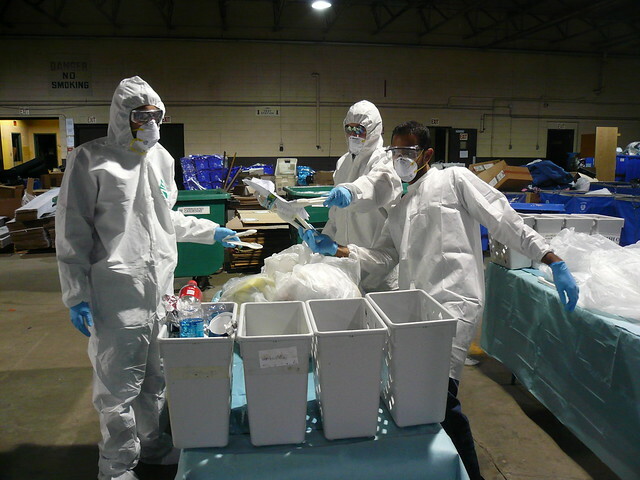 On a nearby table were lab coats and suits, goggles, respirators, gloves, and plenty of hand sanitizer. I wasn’t expecting the sorting to be so hands-on, but once we all suited up, there was no turning back. Each bag was labeled with the name of the dorm it came from. After weighing the bag and recording it, we carefully opened and sorted through dorm trash, using tongs to avoid touching anything dangerous. We prepared for the worst: used condoms, tampons, broken glass, and even syringes and razors. However, the garbage we sorted through was generally harmless, despite the foul-smelling leftovers we encountered. Most of the waste we found was compostable, and there were many recyclables in the trash as well. The experience was definitely rewarding for everyone. 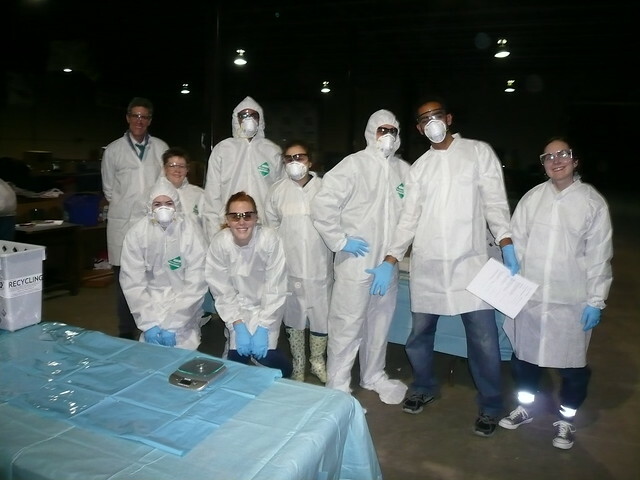 The Nicaragua team decided to add the personal protective gear, including gloves and goggles to their budget, and remarked on the differences they will see in the waste streams of college students in Boston and communities in Nicaragua. I want to use what I saw to make recycling and composting more effective in my own sorority house, where we typically throw out everything. Although MIT has come a long way with recycling and composting, it is still easy to forget where our trash goes. While throwing it away leaves garbage out of site and out of mind, we have to remember that our trash always becomes someone else’s problem. Waste-picking is a dirty and dangerous job, but it provides a livelihood for hundreds of thousands of people around the globe. If we can put ourselves in their shoes, maybe we can make a stronger effort to actually reduce, reuse, and recycle. Above is an analysis of the waste these students sorted through during their trip to the recycling warehouse in Allston, Massachusetts. 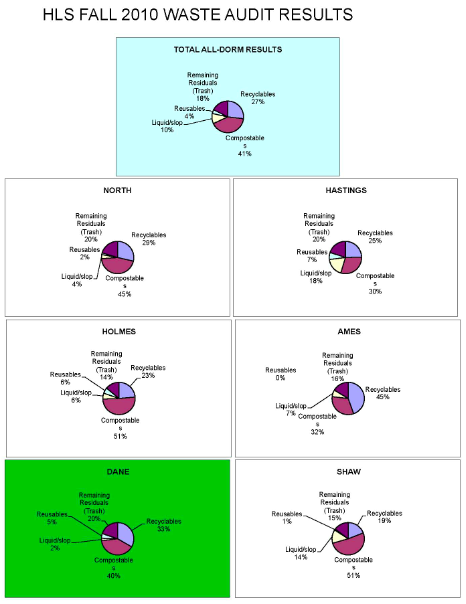 Download a PDF of this data here or by clicking on the image above. Angela, wow, what a great story. It reminds me that the environmental movement has a long way to go in regards to communications, that we should begin to experiment in different ways around connecting the thoughtless action of throwing something away to the reality of where it ends up and who it impacts. What if instead of seeing the nice, neat recycle sign on a bin, garbage cans were covered in images of landfills and waste-sorting facilities ? Similar tactics are being used to stop people from smoking tobacco. In July of this year the U.S. Food and Drug Admin is going to follow Canada’s lead and begin adding photos of photos of blackened lungs, mouth cancer, and other side effects to packages of cigarettes in an effort to get people to quit or stop them from starting the first place. Thanks for sharing your experience. Look forward to hearing about the upcoming work in Nicaragua. Hi Angela. Great post. Congratulations to all of you for having the gumption to get down and dirty. It will only get better in Nicaragua! I can’t wait for the blogs. About four years ago, Omar Freilla of the Bronx Green Worker Cooperatives gave a talk at MIT. He asked his audience of planning students where our trash went. Not a single one of us knew. He shook his head and smiled and then told us our homework was to find out the answer. Four years later (and now a staffperson at CoLab) I am embarrassed to say I still don’t know. Where does MIT’s trash go? Please enlighten us if you have the answer. Good work to all of you guys! i have some question,What was ur first consideration before starting the sorting analysis?